Motorcyclists are at special risk for perminent hearing loss if they don't test and protect their hearing. Motorcyclists are at special risk for permanent hearing loss. Most motorcyclists understand the effects of a "silent killer" which follows them every time they enjoy riding their bikes. Unfortunately, several people still believe the causes of hearing loss are due to how loud the bike sounds, and/or that it affects only the people who do not wear full shell helmets. This is true to a certain degree. Based on several research studies, the major contributor to hearing loss in the motorcycle industry remains the "silent killer" known as "wind noise." Generically termed as the amount of noise turbulence produced around the head while the rider is in motion. Its inherited consequences result in irreversible hearing loss damage over a period of time when adequate hearing protection is not worn. Similar to the shooting and aviation industries, if this issue is not addressed correctly from the beginning the amount of exposure to the inner ear is compounded every time the rider ventures out on his/her bike for hours at a time. Constant duration of harmful level noises gradually force the rider into becoming another statistic of the "silent killer." To put this in perspective, according to OSHA's regulation of industrial noise exposure, an average worker surrounded by levels around 85-90dB for an eight hour day will not exceed the limits of exposure time within a 24 hour period of time. However, when the sound levels exceed 100dB, your exposure time is reduced to two hours. When sound levels exceed 115dB, your exposure time is drastically reduced to 15 minutes. This puts riding a bike a whole other realm as "wind noise" at highway speeds can measure up to 103dB, or comparable to a running chainsaw. At these levels the rider is not only fatiguing physically from the excess noise exposure, but it also puts him into a position of needing a hearing aid later in life. Another common ailment of motorcycle riding is a condition known as "Temporary Threshold Shift," commonly referred to as TTS by audiologists and hearing healthcare professionals. TTS is caused by excessive noise exposure for a duration of time, which drops your actual acute hearing pattern to a lower level temporarily. Meaning, your hearing is less than what it was before the initial exposure. Continuous TTS exposure will result in permanent damage. Everyone has experienced this phenomenon at one time or another, whether it is from going to loud dance halls, or concerts, or even work. Even some of today's movie theatres can cause this to happen, but this is a specific certainty for motorcyclists who disregard adequate hearing protection while riding their bike. Riding position and style of windshield help in preventing "silent killers" ability to fully be experienced. But even the best helmets on today's marketplace provide little help when considering "wind noise" levels at normal highway speeds. Obviously, this factor is increased in half shell models as well as skullcaps, but the common helmets used in today's marketplace are designed to fit entirely over the head providing a snug fit. These types of helmets have the best attenuation value (reduction in noise) regardless of any airflow modifications done to the outside. But these helmets still produce wind noise readings of 110 to 116dB's, from 35mph to highway speeds. When reflecting back to the comparison chart, 116dB will only be suitable for 15 minutes of riding a day. Not a lot of time to enjoy your hobby.... Is it? Although there are several versions of hearing protection devices on the market, a custom set of earmolds is still the best answer in suppressing sound. They provide excellent attenuation values and are comfortable to wear for extended periods of time. They can even be molded with high-grade transducers, which allow for stereo compatibility or communications. To find out more about these products search under our "Product Links" listed on the navigation bar. We also suggest checking with your local state officials on the regulations of wearing hearing protection. Several states have motorcycle laws regarding earplug use. For a quick reference, see the AMA web pages on State Motorcycle Laws - http://www.ama-cycle.org/roadride/road.asp. There is no significant difference in wind noise level as a function of speed, no matter what the helmet brand or model (all being full coverage). Neither the riding position nor the brand or style of motorcycle make significant difference in noise level. Padding inside the helmet, open or closed vents, or added weather stripping on the helmet to alter flow patterns, does not significantly alter the noise level in a helmet. When not wearing a helmet, the wind noise at highway speed is nearly 10 times greater than when wearing a full coverage helmet. Below 30mph, machine, exhaust and environmental noises are heard. Once speeds exceed approximately 30mph, wind noise dominates completely. Some helmets resonate at approximately 500Hz, and actually enhance wind noise. Legal speeds of 65mph can produce wind noise levels at 103dB SPL, (chainsaw, pneumatic drill). This noise is loud enough to cause TTS in your hearing, tinnitus and permanent ear damage. We perform group hearing tests for Gun Clubs, Police departments, Fire and EMS departments ( siren noise) and Motorcycle clubs. Call 1-800 231-1006 for a free quotation on group rates for IPS mobile testing for you members. Mobile Hearing Tests are the most convenient and cost effective way to protect your employees or clun members hearing! Industrial Paramedical Services has been providing complete Multi-Phasic Mobile health testing services to hundreds of Midwestern facilities since 1975. 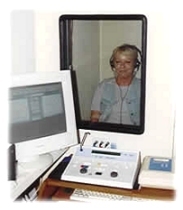 We specialize in providing hearing tests for your employees with patented audiogram recording reports meeting all OSHA requirements. Our clients include major manufacturers in the automotive, utilities, construction, petroleum, aero-space, airport workers and metal fabricating fields. Basically we give hearing and pulminory function tests for those businesses who do not have in-house facilities and trained personnel for this necessary requirement. Our exclusive designed 8 year audiogram record chart can be easily folded into a quick visual aid in educating your employee to how well they are protecting their hearing. Subjecting your employees to noise sources that can cause permanent hearing loss is a serious safety hazard. Early detection of hearing loss can alert both parties to the need for using better hearing protection devices like ear plugs and ear muffs. This site is dedicated to showcasing our uncompromising commitment to scheduling cost effective hearing and pulmonary functioning tests right from our state of the art mobile lab vans.